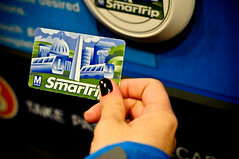 WMATA is testing a new SmarTrip bus and rail pass system that will more automagically integrate bus and rail passes and the SmarTrip system. They’re looking for volunteers, they announced this afternoon, and are offering a week of free transit if you volunteer to help test the system. If you regularly commute by bus, and use one of the following passes, then you may be eligible: Metrobus Weekly Flash, Senior Weekly Flash, Disabled Weekly Flash or the Metrorail Short Trip or Fast Pass. In addition, they would request that you take at least 8-10 trips per week, have a registered SmarTrip card, and not use Smart Benefits as part of your commute. The test will occur in August, and will last for four weeks. You would pay for three of those weeks, and Metro would pay for the fourth. If you want to participate, you can sign up at their website.